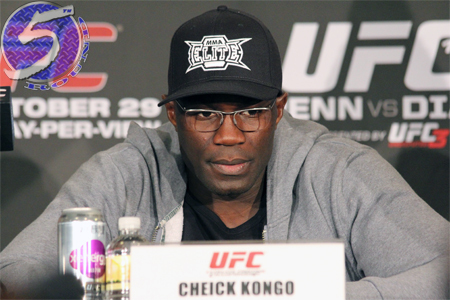 Don’t close the cage door on Cheick Kongo’s (pictured) UFC career just yet … apparently. Despite not having his contract renewed by the planet’s premier mixed martial arts promotion, Kongo claims a return to the Octagon is possible and that he’s in complete control of his own destiny. It has been reported that Kongo was offered a contract extension prior to meeting Roy Nelson last Saturday at UFC 159, but the soon-to-be 38-year-old turned down the offer. Perhaps Kongo was banking on a win to increase his bargaining power. Unfortunately for the heavyweight, he was knocked unconscious and his fighting future is now in limbo. Following the defeat, 5thRound.com confirmed with a UFC official that the promotion has decided not to re-sign Kongo at this time. The kickboxer went 11-6-1 during his seven-year run inside the Octagon. He has never fought for a UFC title.